This is a guideline. 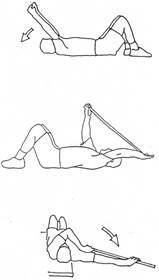 Please discuss with your therapist before starting these exercises. 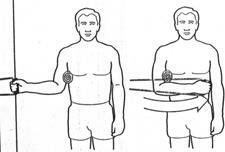 In addition to Taping the shoulder for rotator cuff tendonitis, your therapist should instruct you in ROM exercises followed with strengthening. Avoid active overhead activities until all symptoms have diminished. 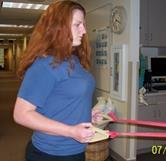 Watch your posture, keep shoulder blades back and down to keep the gleno humeral joint in the right alignment. You may / may not need to start with Heat before exercises. In either case, end with ice after exercises. This exercise is performed by dangling the arm and moving the body. The movement of the body causes the arm to move, helping with ROM. 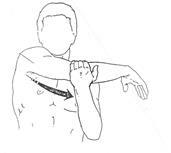 Do not actively move the arm as it may be contraindicated in certain surgeries. Shoulder at 90 deg elbow 90 deg. External rotation done with a cane at first with the elbow by your side and then slowly progressed to shoulder at 90 deg. The affected arm stays relaxed all the time. 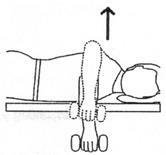 Horizontal abduction: use the good arm to push the affected arm to the side. The affected arm stays relaxed all the time. 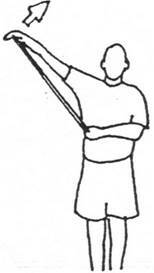 use the good arm to push the affected arm out the the side with the help of the cane. The affected arm stays relaxed all the time. 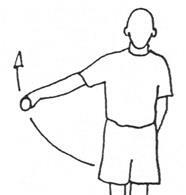 Keeping the elbow by your side (put a piece of paper at your side, if the paper drops you are doing the exercise incorrectly) elbow bent to 90 deg, move the forearm out to 45 deg. Keep your wrist straight. Laying on the ball, bring arms out with palm down, bring arms up to shoulder level while squeezing the shoulders back and down. 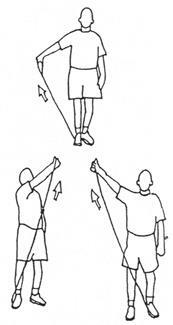 Push the arm up in the air and then slowly depress it. Using a band pull it straight out at a 45 deg angle. 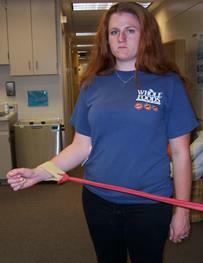 Put one end of the band on the same foot, holding the other end on the arm take the arm to the opposite shoulder. 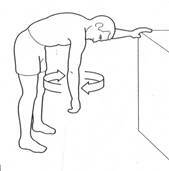 Squeeze shoulder blades back and down and then bring arms straight up. 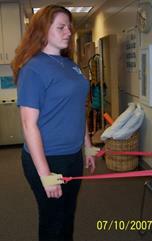 In addition to modalities to reduce pain, you have to strengthen the shoulder to prevent re-dislocation. The shoulder ligaments are Lax and thus the dynamic structures (Muscle) needs to be strengthened to that it prevents the shoulder from re-dislocation.